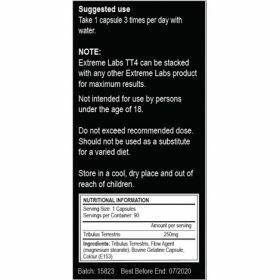 TT4 Tribulus Terrestris is one of the strongest versions of Tribulus on the market today and perfect for anybody looking to seriously increase their natural testosterone levels. Take 1 capsule 3 times per day with water. Store in a cool dry place and out of the reach of children.